Rightwing Rumblings: Satyam Ramalinga Raju deserves capital punishment. Satyam Ramalinga Raju deserves capital punishment. 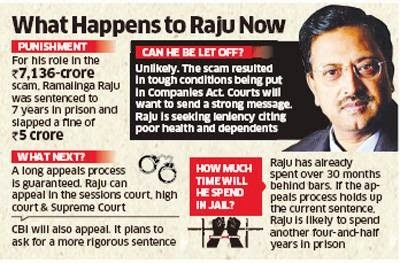 Judgement on Satyam Computers Scam is out , main kingpin Ramalinga Raju was sentenced 7 years in jail and Rs 5 crore as fine. Iam not happy at all with the judgement , Ramalinga Raju should have been awarded capital punishment if not atleast life imprisonment. He played with the lives of employees and investors . He tarnished the image of country. Hereafter all Economic offenses should be treated as Criminal offenses. With due respect to Honourable Judge who delivered the judgement , wanna bring to his kind notice that such judgements might encourage others to commit more heinous economic frauds. What did Ramalinga Raju lost ?? Not much. He swindled Rs 7160 Crore public money and got just 7 years jail. Simple Math tells its Rs 1000 Cr for his family for 1 year of his Jail. Profitable. Anybody would be happy to be in Jail if his family gets 1000s of Crore. Now you know , how Bharat Varsh once Viswa-Guru and richest in the World has turned into poorest country. We always blame Politicians for corruption and forget these greedy entrepreneurs Ramalinga Raju , Deccan Chronicle Venkat Reddy or Kingfisher Vijay Mallya. Their crime is no lesser than sabotaging the interest of Country. Hence , such chicanery should be treated as act of anti-National. Same case that of Satyam Computers in a country like USA , the punishment would have been atleast 2 Life imprisonments. Where in India its just 7 years & Rs 5 Cr fine. Ramalinga Raju has played with the lives of atleast 52000 employees , 20000 stock investors . He risked their lives , punishment should have been multiple life imprisonment and all the properties of his family confiscated and nationalised. Such act would check the greed of other Ramalinga Raju's who are still wandering outside. Now the big Question to ponder upon is , How good is our Indian Judiciary system ?? ?